Raw machine learning data contains a mixture of attributes, some of which are relevant to making predictions. How do you know which features to use and which to remove? The process of selecting features in your data to model your problem is called feature selection. In this post you will discover how to perform feature selection with your machine learning data in Weka. About the importance of feature selection when working through a machine learning problem. How feature selection is supported on the Weka platform. How to use various different feature selection techniques in Weka on your dataset. Photo by Peter Gronemann, some rights reserved. The dataset used for this example is the Pima Indians onset of diabetes dataset. You can learn more about this dataset on the UCI Machine Learning Repository page for the Pima Indians dataset. You can download the dataset directly from this page (update: download from here). You can also access this dataset in your Weka installation, under the data/ directory in the file called diabetes.arff. Many feature selection techniques are supported in Weka. A good place to get started exploring feature selection in Weka is in the Weka Explorer. Click the “Explorer” button to launch the Explorer. Open the Pima Indians dataset. Click the “Select attributes” tab to access the feature selection methods. Each section has multiple techniques from which to choose. The attribute evaluator is the technique by which each attribute in your dataset (also called a column or feature) is evaluated in the context of the output variable (e.g. the class). The search method is the technique by which to try or navigate different combinations of attributes in the dataset in order to arrive on a short list of chosen features. Some Attribute Evaluator techniques require the use of specific Search Methods. For example, the CorrelationAttributeEval technique used in the next section can only be used with a Ranker Search Method, that evaluates each attribute and lists the results in a rank order. When selecting different Attribute Evaluators, the interface may ask you to change the Search Method to something compatible with the chosen technique. Both the Attribute Evaluator and Search Method techniques can be configured. Once chosen, click on the name of the technique to get access to its configuration details. Click the “More” button to get more documentation on the feature selection technique and configuration parameters. Hover your mouse cursor over a configuration parameter to get a tooltip containing more details. Now that we know how to access feature selection techniques in Weka, let’s take a look at how to use some popular methods on our chosen standard dataset. A popular technique for selecting the most relevant attributes in your dataset is to use correlation. Correlation is more formally referred to as Pearson’s correlation coefficient in statistics. You can calculate the correlation between each attribute and the output variable and select only those attributes that have a moderate-to-high positive or negative correlation (close to -1 or 1) and drop those attributes with a low correlation (value close to zero). Weka supports correlation based feature selection with the CorrelationAttributeEval technique that requires use of a Ranker search method. Running this on our Pima Indians dataset suggests that one attribute (plas) has the highest correlation with the output class. It also suggests a host of attributes with some modest correlation (mass, age, preg). If we use 0.2 as our cut-off for relevant attributes, then the remaining attributes could possibly be removed (pedi, insu, skin and pres). Another popular feature selection technique is to calculate the information gain. You can calculate the information gain (also called entropy) for each attribute for the output variable. Entry values vary from 0 (no information) to 1 (maximum information). Those attributes that contribute more information will have a higher information gain value and can be selected, whereas those that do not add much information will have a lower score and can be removed. Weka supports feature selection via information gain using the InfoGainAttributeEval Attribute Evaluator. Like the correlation technique above, the Ranker Search Method must be used. Running this technique on our Pima Indians we can see that one attribute contributes more information than all of the others (plas). If we use an arbitrary cutoff of 0.05, then we would also select the mass, age and insu attributes and drop the rest from our dataset. A popular feature selection technique is to use a generic but powerful learning algorithm and evaluate the performance of the algorithm on the dataset with different subsets of attributes selected. The subset that results in the best performance is taken as the selected subset. The algorithm used to evaluate the subsets does not have to be the algorithm that you intend to use to model your problem, but it should be generally quick to train and powerful, like a decision tree method. In Weka this type of feature selection is supported by the WrapperSubsetEval technique and must use a GreedyStepwise or BestFirst Search Method. The latter, BestFirst, is preferred if you can spare the compute time. 1. First select the “WrapperSubsetEval” technique. 2. Click on the name “WrapperSubsetEval” to open the configuration for the method. 3. Click the “Choose” button for the “classifier” and change it to J48 under “trees”. 4. Click “OK” to accept the configuration. 5. Change the “Search Method” to “BestFirst”. 6. Click the “Start” button to evaluate the features. Running this feature selection technique on the Pima Indians dataset selects 4 of the 8 input variables: plas, pres, mass and age. Looking back over the three techniques, we can see some overlap in the selected features (e.g. plas), but also differences. It is a good idea to evaluate a number of different “views” of your machine learning dataset. A view of your dataset is nothing more than a subset of features selected by a given feature selection technique. It is a copy of your dataset that you can easily make in Weka. 1. Click the “Preprocess” tab. 2. In the “Attributes” selection Tick all but the plas, pres, mass, age and class attributes. 3. Click the “Remove” button. 4. Click the “Save” button and enter a filename. You now have a new view of your dataset to explore. You cannot know which views of your data will produce the most accurate models. Therefore, it is a good idea to try a number of different feature selection techniques on your data and in turn create many different views of your data. Select a good generic technique, like a decision tree, and build a model for each view of your data. Compare the results to get an idea of which view of your data results in the best performance. This will give you an idea of the view or more specifically features that best expose the structure of your problem to learning algorithms in general. In this post you discovered the importance of feature selection and how to use feature selection on your data with Weka. How to perform feature selection using correlation. How to perform feature selection using information gain. How to perform feature selection by training a model on different subsets of features. Do you have any questions about feature selection in Weka or about this post? Ask your questions in the comments and I will do my best to answer. Sir what is the difference between classifierattribute eval and wrapperattributeeval in weka. After applying any of the CorrelationAttributeEval, the InfoGain and the WwrapperSubsetEval, I receive lower accuracy. Of course this is obvious because I end up removing some features, but how is this good exactly? I am loosing information. This is not good, am I wrong? We only want to perform feature selection that ultimately benefits the performance of our models. I use feature selection as a guide, each method gives different hints about what features might be important. Each set/subset can be used as input to train a new model to be compared to a baseline or ensemble together to compete with the baseline. Worse performance after feature selection still teaches you something. Don’t discard those features, or build a model based on this “new” view of the problem and combine it with models trained on other intelligently selected views of the problem. I hope gives more insight on a very important topic that you’ve raised. So, you have used an arbitrary cut-off value for correlation and informationGain in order to select a subset of features. Is there any method to select a cut-off value? I have another doubt regarding the feature selection. In order to select the best subset of features from the output of “InformationGain + Ranker’s” method, I removed low-ranked features one by one and checked the accuracy of my classifier for each subset , and chose the subset that gives maximum accuracy. However, for some data-set, I got same (maximum) accuracy value for 2 subsets of features. For example, I have a set of 21 features, and a subset of 10 features and 6 features give the same maximum accuracy out of all possible subsets. So I am confused for which subset to choose? I would suggest try creating a model with the features using each value as a cut-off, and let model skill dictate the features to adopt. Yes, I like the approach you outline. Fewer features are better (lower complexity, easier to understand). Also, compare these results to a new ensemble model that averages the performance of the models with different numbers of features. I would like to ask you about how can I perform PSO as feature selection algorithm within weka ? Is there any way to add PSO to weka program? Sorry Sadiq, I have not used PSO for feature selection within Weka. I cannot give you good advice. I believe there may be a data filter to apply feature selection and remove unselected features. Perhaps take a look through some of the data filters for such a filter. You can then save the filtered features to a new file and work with it directly. I got confusing situation. I tried CorrelationAttributeEval with my own data set and specified outputDetailedInfo:true in evaluator’s configuration window. Weka gave me list of correlations for each individual value for each feature. This is great, but there is a single feature with only two possible values and both have similar correlation. As I understand, this means that this feature can’t influance the prediction in any way, since the correlation is similar with any possible value… even if the total correlation of feature is one of the best compared with other features. Am I right? It is a very good explanation. But I wonder, basically what is feature selection? If I sum all the attribute value, why the total is not 1 or 100%? Feature selection is a way of cutting down the number of input variables to your model to hopefully get simpler models or better predictions, or both. When performing feature selection, should we perform it in the entire dataset (training and testing) and then split the data? or should we perform it just in training portion? It is a good idea to perform data prep operations on training data only then apply the operations using coefficients/etc. from training data on the test data. 1. I am facing the same problem with feature selection and without feature selection. Without any feature selection method I got 99.10% accuracy for J48, but using CFS, Chi square and IG with different subsets I got less accuracy like 98.70%, 97% etc. Where I am wrong? 2. It is related to Weka GUI and API, why I am getting different results for the same algorithm using gui and api. I searched a lot, but nothing useful found. It is common to get different results each time the same algorithms is run on the same data, consider using the experiment interface instead and taking the average score over multiple runs. Dear Jason ,I am using three ML algorithm such as GA for feature selection,ANN and SVM for classification of data set. I want to use wrapper method,can you advice me how to apply crossover and Mutation operation concepts for pre-process. Sorry, I do not have a worked example of GAs for feature selection. But , why I am getting different results for the same algorithm using Weka GUI and API on the same dataset. I want to make a new feature selection algorithm, Can I make this using WEKA? Yes, you can implement it yourself for use in Weka. Could you please advice me or give me a link to illustrative example! Sorry, I do not have an example. I have struggled hard but could not find straight answers to few questions which apply to classification problems, your views would be very helpful. 1) While Information Gain and Gini seem reasonable, do Pearson Correlation & Chi-Squared filters apply for binary variables / for classification problem typical of Diabetes dataset? 2) Statistics professors & several online media strongly advocate doing attribute selection as part of the Cross Validation inner loop. Not doing so is a way of cheating since the training data has already been used for attribute selection & biases the estimates to produce smaller errors. Ian Witten’s in his MOOC recommends using the AttributeSelectedClassifier. Should these Filter methods be run on a test / validation set when using the Attribute selection tab in Weka? What is the order of the executions of the attribute evaluator and the search method? I am trying to use ant search (with default evaluator fuzzy rough subset) and CfsSubsetEval for attribute evaluator. In this situation, firstly, the CfsSubsetEval function evaluates the attributes and gives the informative subsets (with merits), then ant search is done on all these subsets by evaluating with fuzzyRoughSubsetEval; is it true? Sorry, I cannot give you good advice. This post is regarding Feature Selection from a ready made CSV or ARFF file which could be made from raw data using excel or some python code etc. Can we generate features from any CSV or ARFF or EXCEL file using windowing (1 seconds or more) with overlap (50% or so) in WEKA ? I am using attribute selection in weka for my graduation research about abnirmal behavior in video scenes. I was wondering if I had to set the parameters for each search method of the attribute selection? and also the results of the attribute evaluators I need some explanation. Some experimentation may be required. My assignmant states that I should use attribute selection and do testing to see the best results. Should I use attrubuteSelectionClassified or the attrubuteSelection? Is there any link to show mw how to compare results to come with the best set of attributes? You must experiment to see what subset of features work best for your predictive modeling problem. Can I use my algorithm for feature selection in weka? Yes, but you may have to implement it yourself. 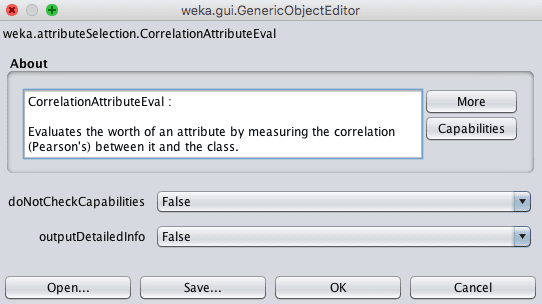 In weka explorer when we are using the correlation attribute evaluate tap after importing our data. It is assigning the correlation coefficient to each of the feature with respect to deciding variable. I want to know how weka will know in which column I have placed my deciding variable? Thank you, you’ve just opened a new world to me! I’m glad it helped Arman. Good question, I would guess “bits”. how can I use weka for deep learning based-feature selection for network intrusion detection system? I don’t believe Weka supports deep learning. HI Jason , Really a good post and informatiove explanation. 2) cn wwe use elbow method ( graph for selecting ) optimal set offeatures using correlation value of each feature with the class. Sorry, I don’t have examples of working with text data in Weka. Does any one knows where to fine PSO in Weka? You’re welcome. I’m happy to hear that. Dear Jason, I’m working on text datasets that represent word frequencies as attributes (which mean I have high dimensionality problem such that a dataset could contain up to 3000 features). I tried to apply attribute selection (both info gain and correlation) filters but nothing change and the number of attributes is still the same. Does that mean all the attributes are needed? should I continue without applying features selection methods? 3K is not a lot. Try modeling the problem directly. Then see if you can get a lift by removing any features. there is a lot of search methods for one attribute evaluator,and different combinations can produce different attribute subset. So how to match attribute evaluator and search method? Thank for all your great articles, the are very useful. I’m not a Data Scientist, so i’m not sure to correctly interpret the result of weka. I have tried to predict fuel consummation of vehicle from their characteristics (40 features) with a deep learning algo, but the precision is two high for the business, error is around 3%. So, I checked my data with weka with the CorrelationAttributeEval + Ranker algo. I find ranks between -0.01 and 0.02. Is these low ranks are an indication that these attributes are not really correlated ?